Grace Shin, MD, MPH, was born in Ontario, Canada, and was raised in Michigan and Louisiana. After being elected to the Sigma Xi Honors Research Society and obtaining her undergraduate degree from Wellesley College in Massachusetts, she went on to receive her Medical Degree (MD) at the Tulane University School of Medicine in New Orleans, Louisiana, concurrently with her Master of Public Health degree (MPH) at the Tulane University School of Public Health and Tropical Medicine. Dr. Shin completed her internal medicine internship at the Cedars-Sinai Medical Center in Los Angeles, California, and her residency in general ophthalmology at the Jules Stein Eye Institute at the University of California, Los Angeles (UCLA). She then finished her fellowship in pediatric ophthalmology and strabismus also at UCLA. Dr. Shin is a diplomat of the American Board of Ophthalmology (ABO). She is an active member of the American Academy of Ophthalmology (AAO), the American Association for Pediatric Ophthalmology and Strabismus (AAPOS), and the American Society of Cataract and Refractive Surgeons (ASCRS). Dr. Shin is married to Gregory Kwok, MD, a local gastroenterologist, and together they enjoy raising their three busy sons. 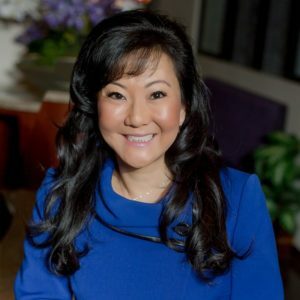 As one of only two Fellowship-Trained Pediatric Ophthalmologists in the Las Vegas metropolitan area providing both medical and surgical care, Dr. Shin has repeatedly been voted a Top Doctor in ophthalmology by her peers and patients. Because Dr. Shin also practices general ophthalmology at Ideal EyeCare, she is dedicated to providing exceptional eye care for the whole family, from newborns to grandparents. Dr. Shin created Ideal Aesthetics to enable busy, wellness-minded individuals to enhance themselves without downtime!